Late last fall, my wife and I moved from our house in the small southern-Iowa city of Lamoni, Iowa, to a place in the country a mile or so outside the city limits. The property included a Morton steel barn-workshop/office and everything that was left behind in it. One of those items left-behind was a John Deere LA 175 riding mower. I proclaimed to anyone who asked–even to those who didn’t ask–that I would never use it. I used several justifications for spurning the Deere. I’ve always used a walk-behind mower, I’d explain, and I liked it–liked the exercise provided by walking; liked the way I’d fall into a rhythm that freed my mind to receive unbidden thoughts or rove through unbeckoned, long cobwebbed, memories; liked the exhilarating flash of a solution to a writing problem or a sudden insight to a book I was reading; liked the way I could look when finished and see physical proof of the improvement my efforts had made; liked the intimate ways of knowing my yard I had gained, the way I palpably experienced its character–its dimensions, its rises and small hollows, its soggy areas after a rain, the exposed tree roots to work around; liked the satisfying buzz of fatigue I felt when finished. And consider, I’d continue, the maintenance the Deere requires. Oil to be changed; oil filter, fuel filter air filter, and air filter precleaner to be replaced; mower and deck spindles and pivot points to be lubricated; wheels to be greased and kept properly inflated; belt tension to be adjusted; belts to be replaced; mower blades to be sharpened and balanced. As Huck Finn would say, “That’s too many for me”–certainly many more, and much more complicated, than my walk-behind requires. 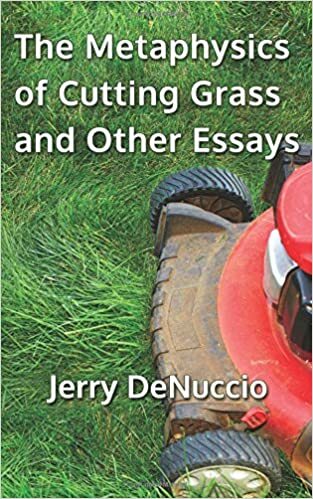 I even asserted, once or twice, that I am a barnacled traditionalist, content with the graces bestowed by walk-behind mowing, ill-disposed to being venturesome when it offered no apparent benefit–indeed, seemingly robbing me of benefit. Perhaps I’m a laggard, but I’m a willing one, perfectly happy to loiter well behind the rope line separating me not just from the new but also from the been-around-but-new-to-me. All of these claims were true, but not the whole truth. The fact is, another reason, a powerful one, one I was ashamed to admit, lurked behind my rejecting the Deere outright. I approach the use of any machine, especially a sizable and powerful machine, with dark apprehension, for experience has taught me that I will invariably stage my incompetence. Now, as a rule, I am not an incompetent person, but put me together with a mechanical device more complicated than a Veg-o-matic and I become a dysfunctional bumbler staggering under the weight of my ineptitude, prostrate before a nightmare beast seemingly sprung from the pages of an H. P. Lovecraft story, unmolested by confidence, much less poise, in its operation. I could read, in fact, have tried to read, the instruction manual, all 137 pages of it, with rapt attention, but the prospect of doing so appalls. The learning curve arcs galactically, and, faced with an ordeal requiring more attentive capacity than I can possibly muster, my brain mutinies, sets me overboard and adrift. Besides, even if I could retain a modicum of pertinent information, I know that when it comes to actually using the machine my mind will shut, its bolt will turn, and its lock will clack. The reasoning part of me understands that my talents simply do not run in the mechanical device direction. It understands, too, that were I in a situation that necessitated the frequent use of such devices, my familiarity with and confident use of them would grow. But there’s another part of me, something deeper down than understanding, something dwelling in the cratered recesses of the more primal parts of my brain, that makes me suspect that, within the apparently obdurate thingness of things, there lurks a shadowy presence, a consciousness of sorts, driven to display itself–purposefully, maddeningly, pitilessly–against our unobstacled use of them, and taking devilish delight in instilling in us an out-to-get-you conviction. How else to explain that when I finally faced the irrefutable equation–extensive, hilly yard + advancing age = John Deere–I experienced, within the first month of its use, the following: the battery died; a plastic deck wheel broke off mid-mow, resulting in a half scalped-half manicured-looking lawn and a twenty mile trip to the nearest Deere dealer. The left front wheel, though properly inflated, exploded mid-mow, sending up a blizzard of black dust and me, once again, to the Deere dealer; the right front wheel fell off its axle, sending me yet again to the Deere dealer for a retaining clip to replace the one that inexplicably disintegrated. There is simply no ritual to perform, no amulet to wear, no litany to recite, that can protect us against such forces. St. Thomas Aquinas teaches that material things are good in themselves. But, then again, Aquinas never had to deal with riding lawn mowers. So, I did the logical thing: parked the Deere, put my push-mower next to it, covered both with a sheet, and bought a 6.75 torque, 3-speed, rear-wheel drive self-propelled walk behind. It never needs an oil change and breezes through the hilly terrain. I get all the benefits of walking without the exhaustion of pushing. Nirvana! Until, of course, the winter snows come and I am forced to get out the snowblower.